The delivery of education in the vocational areas and continuing ed will predominately be done through online technologies, predicted the president of Stanford University. 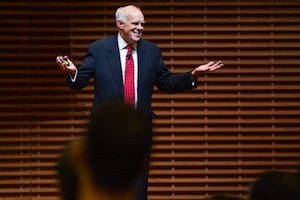 In a talk given to the university's academic council, John Hennessy also said he expected technology to facilitate virtual team meetings to enable delivery of smaller group and project-based classes online and foresees a day when online grading will be good enough to assess short-answer questions and, eventually, complex problems. Hennessy also foretold a day when online analytics will deliver real-time learning measurement and the reuse of materials will lead to more engaging and compelling online learning. The forecast for the use of online tech in education isn't all positive, however, Hennessy also noted that schools will need to overcome credentialing challenges, figure out how students can demonstrate mastery in subject areas, and find ways to reduce costs while still maintaining standards of quality. The talk, titled, "Technology in Teaching and Learning," underscored the importance of a major Stanford initiative, the Office of the Vice Provost for Teaching and Learning (VPTL), which was announced in December 2014. That office combined and absorbed multiple campus divisions, including the institution's Teaching Commons and Academic Computing Services. VPTL is hosting a set of events as part of " The Year of Learning," to explore the future of instruction and learning at Stanford. Hennessy touched on massive open online courses, stating that they may have use in certain circumstances but are by no means a replacement for a structured education, such as that offered by his university. "We've learned that MOOCs are not the answer, at least not the only answer." What makes them attractive, he noted, was also a drawback. While a MOOC is highly accessible, the diversity of students who take them makes teaching them a challenge. What the president did express support for was blended instruction, including the flipped class. Research suggests, he said, that the video portion of a flipped class can have the same outcome as a traditional lecture and may even address the problem of distracted students who sit through large lectures "with short attention spans" and spend their time doing other activities than the one they're there for. Future progress in education, he said, would require experimentation, sufficient computing capacity and the time for trying different approaches. Technology, for its part, can be "amplifiers" that help improve teaching in the future.